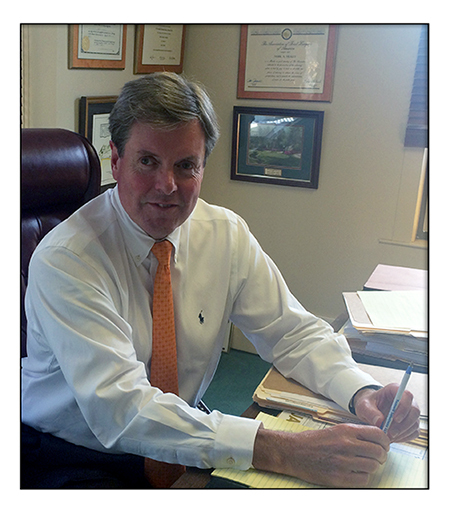 Attorney Mark A. Healey has been practicing law in West Haven, CT for 25 years. He grew up in Orange, CT where he attended Turkey Hill Elementary School. He continued his education at Hopkins School in New Haven, CT, graduating with the Class of 1979. Mark went on to study Economics at Hamilton College where he earned his Bachelor of Arts degree. He then attended Case Western Reserve University in Cleveland, Ohio and received his Law Degree in 1986. Mark began his career in law working with a small, general practice firm that specialized in plaintiff’s personal injury cases. In 1992, he opened his own law practice on Savin Avenue, on the West Haven Green, and has been there ever since. Attorney Healey has represented hundreds of clients with regard to plaintiff’s personal injury matters and has secured millions of dollars in recoveries for accident victims. He also devotes a substantial part of his practice to Worker’s Compensation claims, Real Estate Closings, and Probate, Wills, and Estates. Currently, Attorney Healey is the President of the West Haven Bar Association, a member of the New Haven Bar Association, the Connecticut Bar Association, Connecticut Trial Lawyers Association, and the American Association for Justice. He has been accredited by the Better Business Bureau and is rated as “Highly Ethical and Highly Professional” by Martindale Hubbell.